Based on the high number of inquiries received, we have prepared a comprehensive overview of the Residency Bond Program (Program) in a short frequently asked questions (FAQ) format. Click on the question to read the answer. The Hungarian government just announced that the program will be closed on 31st March. Applications will only be accepted before March 31, 2017. What is the Hungarian Residency Bond Program? Is the Residency Bond Program approved by the Hungarian government? Hungarian Residency Bond Program is extremely popular: number of residence permits issued increases enormously. Until now more than 4700 Residency Government Bonds have been purchased. It is the most popular residency program in Europe. Please read carefully all the information, presented on this website. If you would like to get a lifetime residence permit please, fill in the request form. You will receive additional information and a detailed step-by-step guide about the Program. Is it sure that I will get a Hungarian residence permit if I apply? Be able to provide the documents required. We have a 100% success ratio; all of our clients have received the residence permit. Can my family be included in the Program? Yes. Your spouse and your dependent children and also dependent parents can be included in the Program based on your investment. It means that you and your family can file the applications all together. Please note that you are required to file official documents evidencing your family relationships. Your children, who are not dependent from you, and other relatives may also participate in the Program but based on their own independent investments. You may contact us to find tailor-made solutions for you and your family members. Should I have a Hungarian address when I apply? From the 1st July of 2016 no Hungarian address is required when you apply for permanent resident status. The total amount of money for obtaining a permanent residence permit through the Program is EUR 360,000. Please note that EUR 300,000 will be refunded to you after 5 years. The non-refundable EUR 60,000 is the actual cost of the Program. It includes all administrative and service costs associated with the Hungarian Residency Bond Program. That means you and your family will receive a lifelong residence permit, a safe pass to Europe, for EUR 60,000 only. Our award winning immigration team gives you premium-quality personal guidance throughout the whole Program. Using simple words, we do everything for you in order to get your and your family members’ residence permit. We will care with every detail of your application; you can sit back and relax. Is it sure that I will get back my EUR 300,000 Investment? Yes. The EUR 300,000 will be deposited in 5-year maturity government residency bonds, and after maturity the EUR 300,000 will be refunded to you. For extra security you may also purchase a bank guarantee. No. EUR 360,000 includes everything for a family of four. If your family, including your spouse, dependent parents and children is larger than four, you should pay the overhead costs only. What is the difference between temporary and permanent residence? A Hungarian residence permit grants a foreigner the right to reside in Hungary. The temporary residence permit is limited in time (usually 1-5 years), while the permanent residence permit is issued for your life. Holding a Hungarian residence permit makes easier traveling throughout Europe and to obtain visas to other countries, e.g. USA, UK. What rights am I entitled to after receiving a Hungarian permanent residence permit? Hungarian permanent residency offers all the rights and benefits that citizens enjoy in Hungary but with some notable exceptions, such as not being eligible to vote in national government elections or hold Hungarian passport. The Hungarian permanent residency holder may live, stay and work in Hungary for an indefinite period of time (lifelong). Permanent residency holders are entitled to attend Hungarian public schools. The permanent residence permit allows you to enter Hungary without a visa and to stay in Hungary without any time limitation. With a Hungarian permanent residence permit you can travel and stay within the Schengen area. 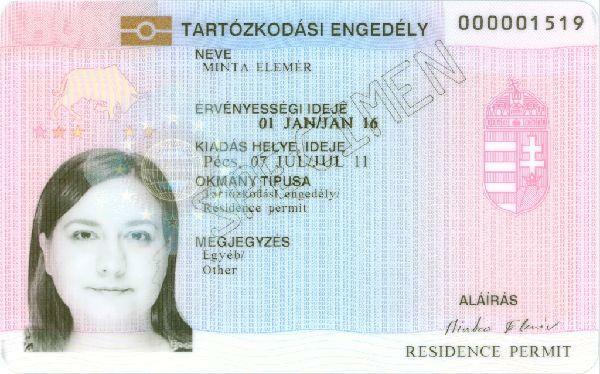 Is the Hungarian residence permit an ID card? Yes, it is. The permanent residence permit looks like this. Am I going to lose the right of a lifetime permanent residence permit, if I get back EUR 300,000 after 5 years? No, you wont. Permanent residence permit is really permanent. After 5 years you will get back your investment but you and your family can keep the permanent residence permit. If the program will be canceled in MARCH, will I lose my residence permit? No, you wont. Your permanent residence permit is not revocable unless you comit a serious crime in Hungary. Even if the program would be cancelled in the far future, you and your family can keep the permanent residence permit. I need a Hungarian passport. What time should I wait to be a Hungarian citizen? Do not forget that the permanent residence permit is issued for an indefinite period of time, i.e. it is a lifelong residence permit. However, you can upgrade your Hungarian permanent resident status to a Hungarian citizenship, but to do so you need to live in Hungary for 8 years. There are rumours about the reduction of 8 years to 5 years on the internet. Some agents may tell you that you will get a Hungarian passport after 5 years. But it is not true. The Hungarian government has definitely no intention to change the citizenship rules. Should I also pay tax in Hungary? No, you should not. You are a subject of the Hungarian tax system only if you stay in Hungary more than 182 days in a 12-month period of time. Should I live in Hungary in order to keep my residence permit?